Spring is such a special time. Living in Chicago, the winters can be brutal. This is due to the length of the season. It is very cold for months and while the rest of the country enjoys warm temperatures and healing sunlight, the bitterness lingers through most of the spring months. Brief moments of sunny t-shirt days are soon overshadowed by fog and rain. The cold reappears like a specter to remind you that it is never truly gone. It is there always in your mind. Long summer days are coming, but they are fleeting. Though, these days become special and worth fighting for. Worth breaking through the elements. 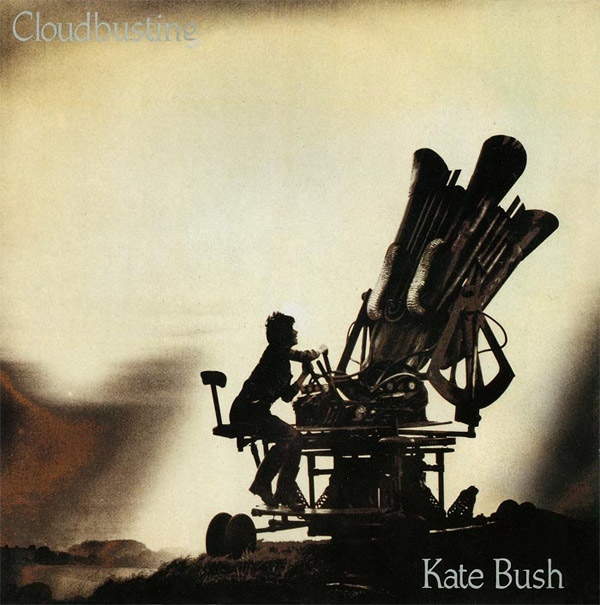 Kate Bush’s “Cloudbusting” is so melancholy, but also brimming with hope. Bush sings that every time it rains, thoughts of someone special keep her safe and warm like rays of sunlight shining through dark clouds. An overwhelming sadness consumes Bush, but it is a beautiful sadness. In her quivering voice, the hope of something better is on its way shines through. The weather themes in the lyrics work so well against the backing track. The strings and percussion are reminiscent of storms. Thunder rolling through the country with driving rain falling all around Bush. As the song continues, a deep wavering synth blows through like strong gusts of wind threatening to take Bush away. Thoughts of losing herself and the bitter, wet cold shakes her to the very core. Bush needs to stay strong and fight against the winds and rain. Busting through the clouds brings its own rewards. The warmth of a sunny embrace waits on the other side. As the song closes out, Bush is joined by a chorus of voices signifying the end of the storm and the sun coming out illustrating that we are not alone in this struggle. We all must do some cloudbusting sometimes. In life, we all experience the highs and lows. The lows make us question ourselves and our ability to survive, but we ultimately find solace in the fact things will get better. Nothing lasts forever, and that counts for both the good as well as the bad. The stormy days are what makes the sunny ones even more special. Today, it is very foggy in Chicago. And it has been rainy and cold after a beautiful, bright weekend. That weekend will come back and there will be more. This past winter was tough for me on several different levels, but that’s over. I’m very excited about the warm weather and the summer. Planning trips and other activities that allow me to enjoy the weather and the outdoors is very exciting. Everyone in the city is ready to breakthrough and enjoy the weather. Under the light of the sun, all men and women are equal and free. If something is troubling you, take time to do some cloudbusting. Find your sunshine. Do what makes you happy and feel alive and please share that with the great people around you. Forget the sunshine stealers. Something good will happen. This entry was tagged cloudbusting, fog, hounds of love, kate bush, music, rain, thunder, weather. Bookmark the permalink.